Forget Vampires, Tsunami Disasters or Zombie Apocalypses, the Great White Shark has been universally feared since the making of the blockbuster movie Jaws in 1975. Considered one of the greatest films ever made, Jaws became the highest grossing film of all time, until the release of Star Wars. While the movie was a hit, making a mechanical shark much bigger than a real shark, that was scary enough for the box office impact its makers intended, did not come without its challenges. Affectionately known as Bruce the mechanical shark frequently broke down. In order to deal with the challenges and deadlines faced, director Steven Spielberg effectively used the viewers imagination to scare the pants of his audience, because he knew that; it is what you don’t see, that will scare you the most. Jaws is a giant creature from the deep that can approach its victims, while out of their natural element, unseen, that hunts and eats you. Due to these factors it has become one of the most effective horror movies ever made. While there should be no doubt its intention was to entertain and be seen as the creative genius of fiction that it was, it unfortunately has also created a forty-year publicity nightmare for world-wide shark populations. The author of Jaws, Benchley later had regrets about the way he portrayed the cold-blooded creature becoming a conservationist himself. Saying in a 2002 interview with National Geographic, “the greatest misconception about sharks is the theory that sharks target humans, that they are man-eaters. Nothing could be further from the truth. Every time you see on TV people surrounded by sharks, the chances are 99 percent that the sharks have been baited, and it gives a false impression, because by nature sharks will stay away from people." He continued to reiterate that the book was pure fiction and said if he had known then the true nature of sharks, he would not have written the book. Earth Angles mission through this documentary is to delve in to some of the misconceptions surrounding sharks today and educate viewers on the plight of the Great White shark. Travelling to the shark nurseries of Guadalupe, Mexico with leading marine biologists and activists we will discover the true nature of the Great White Shark. Through cage diving and deploying a maned submersible to venture deep in to the unknown world of the Great White shark we will document and witness first-hand the habits and behaviours of this incredible apex predator. Since the 1950’s we have lost 90% of sharks from our oceans, if we lose the apex predators, we in turn will witness the collapse of the ocean ecosystem in our lifetime, sealing not only the fate of our oceans but life on earth as we know it. We would considerably speed up climate change: The oceans help regulates the carbon cycle of the planet. Coastal ecosystems store about 50% of the world’s carbon. Sharks are a crucial factor in keeping that carbon stored. The carbon is stored in marine plant life, and without sharks many of the animals that eat these plants would no longer face a predator threat. So, their populations would grow and end up consuming too many of these plants, releasing a flood of carbon into the atmosphere. Earth Angels tell this important story through the eyes of scientists, environmentalists and activists fighting on the frontline, in a race against time to save the shark. Following scientists and activists in to the field to give a much-needed voice and inspire adoption of a different perspective on an animal that is universally feared and misunderstood in an effort to save mankind itself. While humans fear Great Whites there is little reason to protect them, therefore dispelling the myths surrounding this incredible creature of the deep is paramount to its survival. Myth 1: Great Whites are man eaters. Great White sharks do not seek out human prey, there is even some evidence they dislike the taste. While there have been rare attacks when a human has been partially or totally consumed, a large predatory shark such as the Great White, would have to eat a lot of people to survive and this clearly does not happen. Getting taken by a Great White or indeed any shark when you swim between the flags and close to shore in shallow water in the daytime is about as likely as being hit by a meteorite. The odds are infinitesimally low. In the United States, a person's chance of getting attacked by a shark is 1 in 11.5 million, and a person's chance of getting killed by a shark is less than 1 in 264.1 million. Numerous media reports and statements from politicians claim Great White shark populations are surging and attacks increasing. The biology of the species makes this extremely unlikely. Females start maturing when they are close to five metres in length and are about 18 to 20 years of age, due to their slow rate of maturity and the pressure put on them from world fishery practices, populations are very slow to increase. Myth 4: Adult Great Whites grow to 11 meters in length. Only comparatively recently has a serious effort been made to establish how big Great White sharks actually grow. As opposed to the 11meter monster portrayed in Jaws the largest specimen ever reliably recorded was a 6meter Great White from Western Australia. PART 2 - The plight of the Great White shark. Sharks evolved 450 million years ago, long before the dinosaurs, and have survived five major extinctions. Far from being the solitary hunters of mythology, sharks are intelligent, social animals, many living in schools with more complex migration patterns than birds. 75-100 million sharks are killed each year and as apex predators at the top of the ocean's food chain, Great Whites are not accustomed to being preyed upon. As slow growing, long living and late breeding animals, it is extremely hard for them to cope with sustained attacks from driftnets, longlines and bottom trawling. Knowing this, the Great White shark has much more to fear from humans than we do from them. Guadalupe Island, Mexico is the top destination for great white shark encounters. This small volcanic island, located in the Pacific 240 kilometres off the west coast of Mexico’s Baja California peninsula, outperforms both South Africa and Australia with shark-seeing consistency and conditions. Only Guadalupe Island can boast shark viewing in beautiful clear blue water with 30 – 45meter visibility. 261 Great White shark individuals have been identified in the bay where the submersible cage diving operations take place. Accompanied by professional dive masters and shark experts, these unforgettable encounters are a chance to witness up close and personal the true nature of this magnificent animal. 71% of the earth’s surface is covered by ocean and yet we have explored only 1% of the oceans floor. We know more about deep space than the deep ocean, yet the deep oceans are alive with species we are yet to understand and even discover. Sharks live and interact mainly at depths scuba divers would not survive. In order to uncover the mysteries of the Great White shark it is necessary to venture to depths of 300m or more. Studying their social behaviours, migratory patterns and finding their nurseries is vital information needed in order to lobby for their protection. 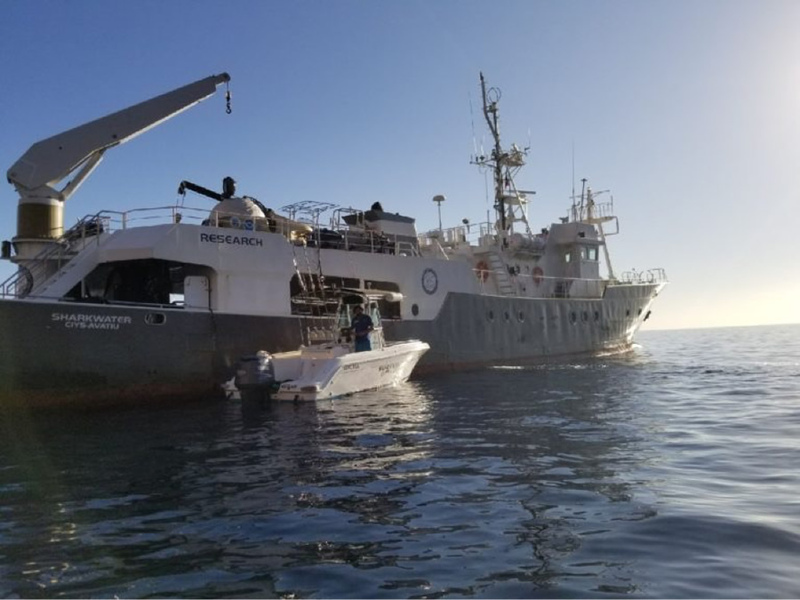 On board the Shark Water vessel there will be a two-man submersible to take Earth Angles crew to depths few have gone before to explore and document the deep ocean and help uncover the mysteries of the deep. PART 5 - The True Nature Great Whites. We know very little about sharks: it is difficult to study an animal that never surfaces to breathe. We have only seen a limited repertoire of the shark’s behaviour, mostly Great Whites hunting at the surface. Little about courtship, parenting, communication or socialising. Sharks remind us, through their longevity on the planet, of our insignificance in the universe and of the discoveries still awaiting us on our planet. They are a symbol of humanity’s thirst for knowledge and an inspiration to go further to learn more. Research into fighting cancer, Alzheimer’s, heart attack and stroke currently benefits from breakthroughs made by shark research. Sharks also have personalities and live rich and complex social lives. They are fast learners and build maps in their heads allowing them to accurately navigate vast distances. Earth Angels aim to explore and expose the true nature of the Great White shark in a way that breaks through fear and builds compassion for a creature who reputation is undeserved. In the tough game of winning hearts and minds in the world of wild animal conservation, the game is demand reduction. Specifically: reducing commercial demand for wild animals that drives the poaching in the first place. Legalizing a commercial trade in a rare or endangered species in order to save that species does not work, because a legal market will spawn a parallel illegal market. The good news is long-standing consumer behaviour can and is changing. The most effective way to engage people and inspire change is to learn and share the truth about cruelty, over consumption and waste. When this happens, most will act compassionately. Convincing consumers not to buy a product is a long and hard-fought battle and you cannot conduct a campaign to stop the trade in wildlife until your audience knows there is a wildlife trade in the first place, knows how bad it is, and knows why it is bad. 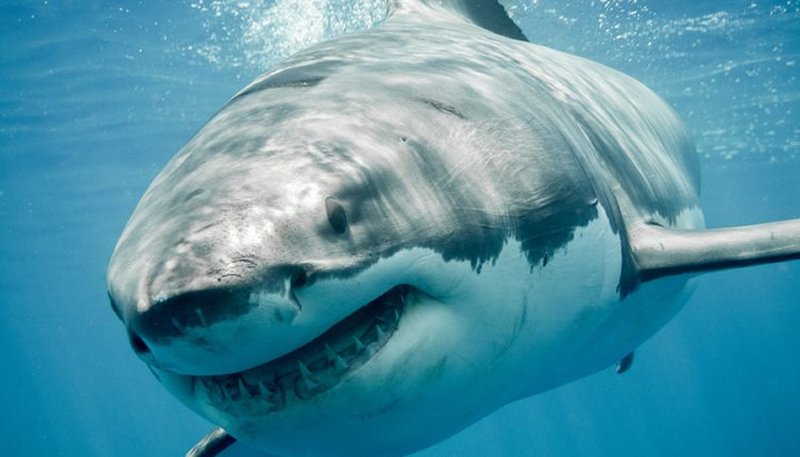 In the fight to save the Great White shark the first thing to do is to start the conversation using “Key Opinion Leaders.” Through the familiar image of someone the consumer likes and can connect with i.e. ; models, actors, sports star, humanitarians and activists, there is a real chance of breaking through the noise, start the conversation, let it evolve naturally over time and hopefully go viral, in order to change consumer behaviour. The majority of films on sharks focus on predatory behaviour, it is Earth Angels aim to rehabilitate the image of the Great White shark showing the audience a perspective rarely seen with the aid of Key Opinion Leaders. The Dive Equipment and Marketing Association Show (DEMA) is the largest professional dive exhibition on the planet attracting everyone who is anyone in the dive industry and marine conservation fields. 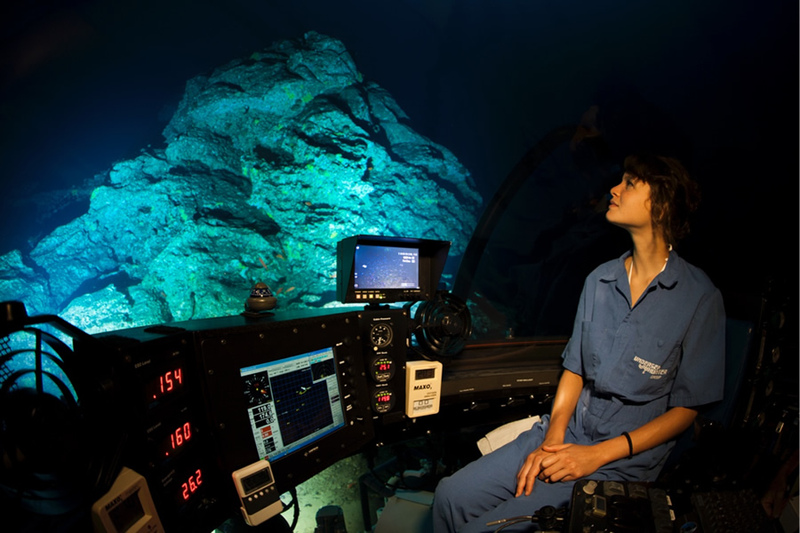 Earth Angels will interview “Her Deepness” Sylvia Earl and other industry and conservation leaders in an effort to unlock the experiences of the first humans to dive on the planet. Documenting the human experience of diving over the last 75 years, what it was like, how it has changed and what we can do to save what is left.